When people hear “Canadian” one of the first things they think of is “Hockey.” But another key part of being Canadian is having each other’s back and showing our true north strong to the world. When I worked at JWT as part of the Share of Heart team for Tim Hortons, we focused on finding ways to showcase and celebrate Canadian pride. To help bring the newest Twitter products to our media clients, I led Twitter Canada’s #ProductShowcase roadshows for Canada’s top agencies. Not only did I coordinate the product, agency development, and sales teams together to make this happen, I also worked on ways to enrich the showcase and learning experience. One fun feature I had created was this custom tweet-activated light box that showed the power of Tweets in real time. When Twitter launched its new video ad product in fall of 2015, each global Twitter HQ executed a #VideoNow product launch. For Canada, I was the lead on this launch project. In my regionalized launch, I organized an event that attracted several executive clients, created a customized video narrative deck for the sales team, partnered with a major industry publisher to have them include videos in their Twitter feed, and had a special video kiosk custom made to encourage clients to better associate video with Twitter. One of my favourite projects: helping teens, young adults, parents and community members tell their stories of how THCF camps change lives. I worked on the project from concept to final delivery, and had the pleasure of being on-site for every second of the filming. 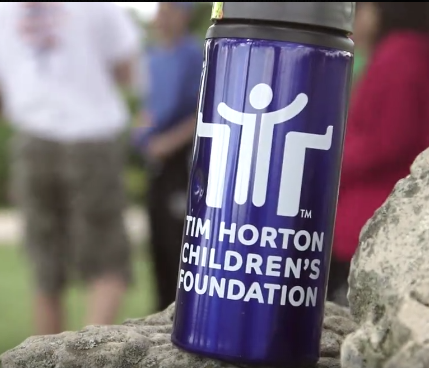 Hearing these stories is truly touching, and I’m grateful for helping give everyone in this video a chance to share what THCF camps mean to them. At JWT, we loved seeing Tim Hortons cups in hand. But where we didn’t like seeing them was on the ground. 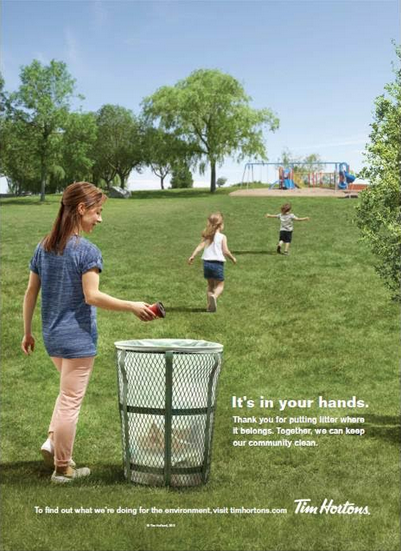 As an environmentally conscious company, Tim Hortons wanted to remind Canadians to place empty cups where they belonged. As the leading account person on the 2013 anti-litter project, I managed the creation and shipment of an anti-litter radio spots, regional ad packages (for newspapers, local bulletins, etc.) and in-store signage like this piece. Taking this commitment seriously, I also worked with production to source environmentally responsible poster stock. Tim Hortons restaurants are staples in their communities. When a new restaurant opens, people get excited and prepare to change their daily coffee and snack routine. When a location closes for renovations, the community expects notice and a grand reveal when their beloved Tim Hortons comes back. As the lead at JWT Canada on the “Grand Opening “ project, I delved into one of the most logistically complicated projects of my career. We needed to create customizable kits for different construction situations (closed or open under renovation, new build) and that could work for diverse store locations across the country. In addition to signage and messaging, we also wanted to make sure the pieces reflected the excitement of getting a new and fresh Tims restaurant. In working closely with the Tim Hortons regional marketing team, Tims distribution, and our production department, I spearheaded a plan that satisfied every party, including communities and restaurant owners. This success was a result of data and excel sheet mastery, and out of the box thinking that led us to introduce brand new POS formats. Today you can still see this kit in use and I always feel a bit of pride whenever a new Tim Hortons opens. How do you win the hearts of foodies? By showing them delicious meals and recipes of course! To help Canadians make the most of their grocery basket, Sobeys worked with the team at Totem Brand Stories to bring this drool-worthy magazine to life. The focus of Inspired magazine was to give Sobeys shoppers more info about the foods they enjoyed, provide tips for eating and living better, and to introduce new foods and recipes they hadn’t yet discovered. As part of the Accounts team working on this magazine, I was the Microsoft Project whiz who created the work back schedules, manager of product information and sourcing, and regionalization expert. Not only did I work to keep us on our deadlines, I also coordinated between the writers, chefs, suppliers, and food photographers to make sure everyone had what they needed. I was also hands-on at the proofing phase to make sure all product and regional information (such as pricing) was accurate, and was in daily direct communication with the Sobeys marketing team. The hardest part of this job was tracking nearly a hundred product skus seasonally. The easiest part was attending tastings and trying delicious new recipes and products.